Cincinnati Bengals tight end Jermaine Gresham scored 2 touchdowns in their 27-10 victory against the New Orleans Saints on Sunday. For his second touchdown Gresham decided to flip the ball into the stands to a female Bengals fan and the 15 second video below will show you what happened. 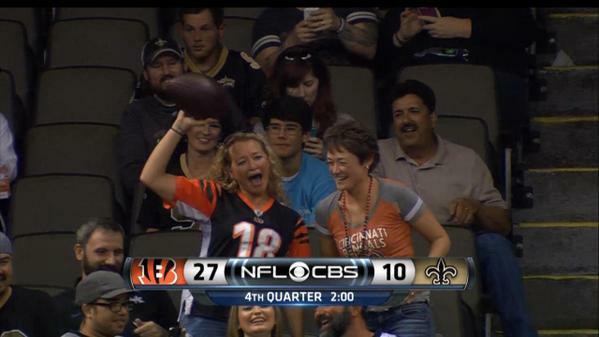 Bengal’s fan Christa Barrett after receiving a football from the Saints. According to the Cincinnati Enquirer the ladies name is Christa Barrett and the selfish Saints fan is Tony Williams. According to Mr. Williams he is not giving the ball to the Bengals fan anytime soon. When asked if he would give the intended fan the football Tony said, “Noooooo, it is pretty simple, I caught the football.” But, in his defense he did apologize for nailing Christa with an apparent elbow saying, “I didn’t mean to hurt the young lady, I was just reaching for the football.” But later on in the game a member of the Saints presented her with a football. There was a second great thing that happened at the Mercedes Benz Superdome on Sunday. You may know about Devon Still and his daughter Leah. Devon was selected with the 53rd overall pick in the 2012 NFL Draft. He played two seasons with the Bengals, but was cut in August of this year. Just prior to him being cut from his defensive tackle spot for the Cincinnati Bengals his daughter was diagnosed with Neuroblastoma stage 4 cancer. 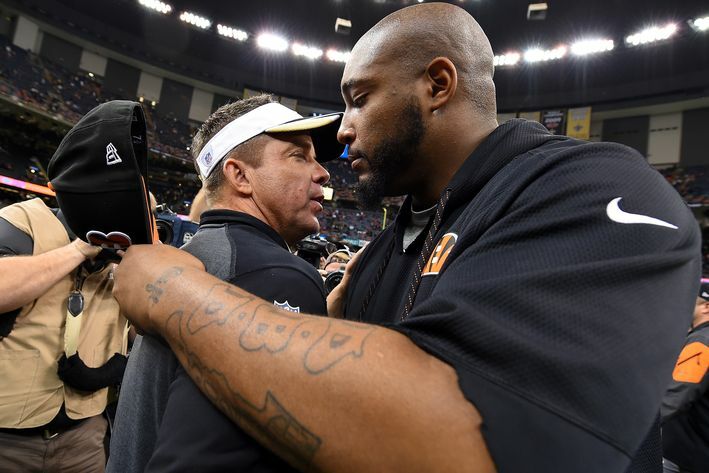 Sean Payton and Devon Still meeting for the first time on Sunday. Still was attempting to heal from a hamstring injury, which was why he did not make the Bengal’s 53 man roster at seasons beginning. When Still was told of him being cut he responded, “I completely understand where they were coming from….”I can’t give football 100 percent right now. In the business aspect they want guys to solely focus on football, which is understandable. We are here to win this city a Super Bowl and right now I am not in a position where I can give football 100 percent of everything I have.” Coach Marvin Lewis did however offer Still a position on the practice squad so that he could continue to pay for his daughters treatments. And, being that he was on the practice squad, he did not have to travel with the team and could therefore concentrate more on Leah. The Bengals demonstrated their loyalty even further by permitting Devon Still’s jersey to be sold in order to raise awareness for pediatric cancer research and the Cincinnati Children’s Hospital. $400,000 sales were made in four days. As of Sunday approximately $1.5 million has been raised so far to help with research because of those jersey sales. Of those $400,000 sales in those four days, $10,000 of it belonged to Saints head coach Sean Payton. He purchased 100 of the jerseys on September 10th (the second day they were available) and gave them as gifts to kids at the local Boys and Girls Club as well as Cincinnati Children’s Hospital. On September 10, 2014 Still was moved from the practice squad to active status. On Sunday, even though Still was inactive for the game, he was able to meet and thank Payton in person.